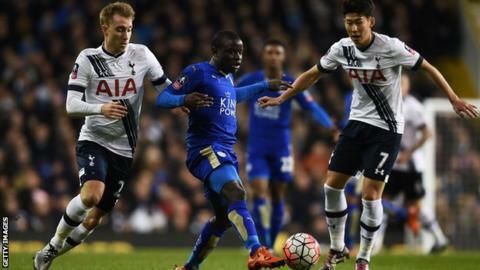 The FA Cup third-round replay between Leicester and Tottenham Hotspur will be shown live on BBC One on 20 January. The game kicks off at 19:45 GMT at the King Power Stadium with the winner away at League One Colchester in the fourth round. The sides drew 2-2 at White Hart Lane on Sunday, with Harry Kane scoring a late equaliser from the penalty spot. BT Sport has not yet announced which of the third-round replays it will be broadcasting.